Enable your support and sales teams by giving them the visibility they need. With this Zendesk and SuiteCRM integration your teams will be able to stay up-to-date on all relevant records whether you are in Zendesk or in SuiteCRM. No longer do you have to click between SuiteCRM and Zendesk to see relevant information. This integration will allow you to see your SuiteCRM Contact, Lead, Account and Opportunity data right from within Zendesk. It will also allow you to view your Zendesk Tickets from within SuiteCRM. Zendesk is a platform that helps turn interactions into lasting relationships. As many SuiteCRM customers are finding out themselves, it is a better way to do support for your customers. With Zendesk your team can accept and manage chat messages, phone calls, and emails all in one place. Immediately after installing the module and adding the Zendesk Tickets dashlet in SuiteCRM, you can see all of the associated Zendesk Tickets on your SuiteCRM Contacts, Leads, Accounts and Opportunities. You can filter and sort to get to exactly what you need to see without having to flip back and forth between SuiteCRM and Zendesk. You can click the arrow to open the ticket in Zendesk, or you can click the Ticket Subject and see all of the Ticket details, including all public and private comments, without ever having to leave SuiteCRM. During the installation process we will automatically install the new Zendesk App to your Zendesk account. The next time you go to Zendesk and look at a Ticket, Person or Organization you will see all of the associated SuiteCRM Contacts, Leads, Accounts, Opportunities, etc we can find from the SuiteCRM side. This view appears in Zendesk Support and Zendesk Chat (Zopim). Do you have custom fields or modules you would like to see in the Zendesk app? Not a problem. Any custom modules that have a link to your Accounts, Contacts, Leads modules can be connected and displayed in Zendesk. You can also customize the exact fields you would like to see in Zendesk. Do you have custom workflows in SugarCRM that need to trigger when Zendesk tickets are created or updated? Or maybe you want to report on Zendesk tickets within Sugar? 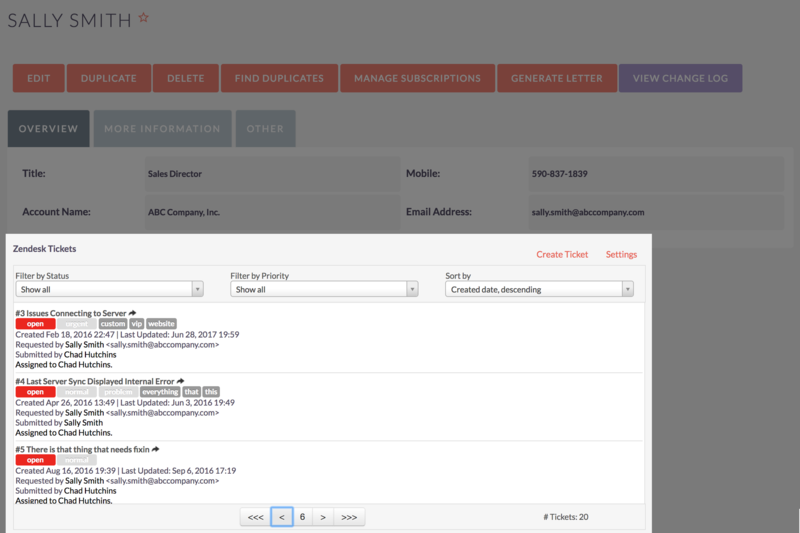 Or maybe you have a customization that relies on SugarCRM Cases module? 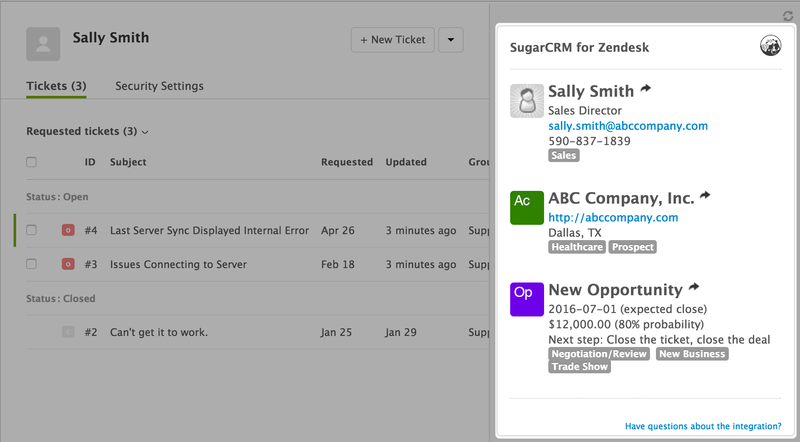 The Zendesk Ticket to SugarCRM sync allows Zendesk Ticket, User and Organization data easily flow into SugarCRM when Zendesk Tickets are created or updated. The process is very flexible and configurable. You can sync Zendesk Tickets, Users and Organizations to any modules and fields (including custom modules and custom fields). For many of our B2C customers, there is a need for having all of their SugarCRM contacts be automatically synced to Zendesk. When a customer contacts support (via email, chat, phone, etc.) and it is received by the support agent in Zendesk, with the SugarCRM to Zendesk contact sync enabled, all of the information from Sugar about that contact would already be visible and accessible by the support agent. This is handy whenever SugarCRM might contain a phone number and email address, but Zendesk may not know about either of those contact data points. With the contact information already synced over, at the time a customer calls in, emails, starts a chat, the information can already be populated. 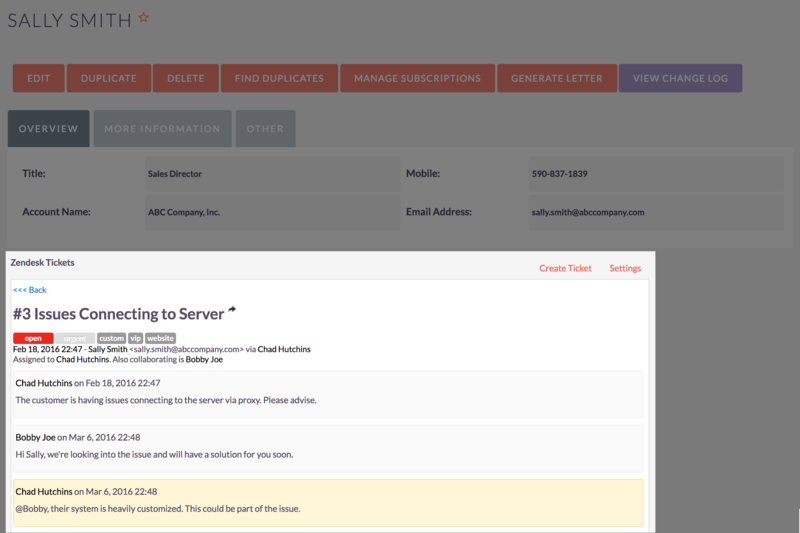 This integration was built using the latest SuiteCRM and Zendesk APIs. It uses OAuth authentication to safely and securely communicate with Zendesk. This gives you the control to revoke access at any time. Click here to start your free trial. You can use the full solution for a full 30-days. After going through the checkout process you will be provided the license key and download needed to try the product. If you have any questions at all create a support case and we'll help you. The Ultimate edition provides advanced Sugar Contact to Zendesk User syncing and everything listed below. This is commonly used by our larger B2C customers. It also includes everything below. In the Professional edition, you have the ability to see more modules and more fields from SuiteCRM within the Zendesk App. This allows you and your Zendesk support agents get to your business-specific information they need all from within Zendesk. We'll even set it up for you. In the Basic edition, there are a number of supported modules and fields by default. Learn more to see that full list and learn more about configuring modules and fields in general.